You need 12 V to run an electric train, but the outlet voltage is 120 V. What is the ratio of the number of turns on the primary coil to the number of turns on the secondary coil of the transformer you are using? The ratio of the number of turns on the two coils determines the ratio of the voltages. 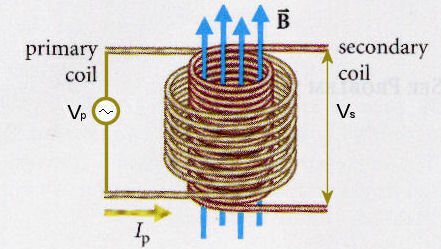 Self-inductance is the reason that the emf induced in the secondary coil is inversely proportional to the number of turns of the primary coil. If the primary coil has more turns, it is harder to produce a rapid change in current flowing through it, because of the back emf produced by self-induction. This effect limits the current and therefore the magnitude of the magnetic field produced by the primary coil, which in turn limits the magnetic flux passing through the secondary coil. Assume the same field B is penetrates both coils and the flux per turn ΦB is the same for both coils. The total flux per turn is due to the currents in both coils. In a well designed transformer, the resistance of the coils is small, and we neglect it here. Then the induced emf in the primary coil must exactly balance the applied voltage Vp. Since ΦB is the same for the secondary coil, the induced emf in the secondary coil is εs = N2dΦB/dt. As long as no load is connected, we measure an output voltage Vs = N2dΦB/dt. N1/N2 = V1/V2. You need a transformer with ten times as many turns on the primary coil as on the secondary coil. A large coil of radius a is lying in the x-y plane, centered at the origin. A coaxial small coil of radius b << a with its axis parallel to the z-axis lies at a distance z above the large coil. The small coil carries a steady current I. (a) Find the magnetic flux coupled into the large coil. (b) If the small coil moves along the z-axis at constant velocity v = v0k, what is the emf ε induced in the large coil as a function of time? Let z = 0 at t = 0. After finding the mutual inductance of the coils as a function of coil separation, we can find the flux through the large coil and the induced emf. (a) The flux through the large coil due to a current I in the small coil is F = MI. To find M, we calculate the flux through the small coil due to a current I in the large coil. The field on the axis of a current loop of radius a is B = k μ0Ia2/[2(a2 + z2)3/2] (SI units), if the current flows in the φ direction. The flux through the loop of radius b is F = ∫AB∙n dA. F = MI, M = πb2a2μ0/[2(a2 + z2)3/2]. ε = (3πb2a2μ0I/2)(zv0/(a2 + z2)5/2). A toroidal coil of N turns has a square cross section, each side of the square being of length a, and inner radius b. (a) Find the self-inductance of the coil. (c) Find the ratio of the self-inductance of the coil to the mutual inductance of the system. Ampere's law can be used to find the magnetic fields due to the coil and due to the wire. By finding the flux of these fields through the coil we can find the self inductance and the mutual inductance. (a) Amperes law yields the magnetic field inside the torus due to a current I in the windings. Symmetry dictates that the magnetic field points into the (φ/φ)-direction. B = (φ/φ) μ0NI/(2πr). Here N is the number of turns of the windings. F = ∫ B∙dA = [μ0N2I/(2π)]a∫bb+a(1/r)dr = [μ0N2I/(2π)]a ln((b+a)/b). F = LI, L = [μ0N2a/(2π)] ln((b+a)/b). (b) Amperes law yields the magnetic field inside the torus due to a current I in the wire. F = ∫ B∙dA = [μ0NI/(2π)]a∫bb+a(1/r)dr = [μ0NI/(2π)]a ln((b+a)/b). F = MI, M = [μ0Na/(2π)] ln((b+a)/b). A long cable carries current in one direction uniformly distributed over its circular cross section. The current returns along the surface (there is a very thin insulating sheath separating the currents). Find the self inductance per unit length. Self inductance, Ampere's law, U = ½LI2 = (1/(2μ0))∫ B2dV. ½LI2 = (1/(2μ0))∫ B2dV for the self inductance L.
Assume the wire has radius a and is concentric with the z-axis. Assume it carries a current I.
r > a: B = 0.